Since Ep 9 is going to be the last Skywalker movie, I’m really hoping that Mr. Original Skywalker himself has some sort of appearance. I read an article where it talked about his force ghost going back and forth between Anakin and Darth Vader, like some sort of phasing, representing Kylos struggle between the light and the dark. That’d be kinda cool, although I don’t know how that’d be possible in the SW Universe (could a force ghost be both light/dark?). I thought that the sith didn't get to become force ghosts, at least not like we see Obi Wan. Having a separate Anakin and Vader ghost would undermine the premise that Vader was turned back into Anakin. I would say whatever lore or fanspeculation there is on this issue could easily go out the window. Anakin was made from the force itself - While QGJ strayed from the traditional teachings of the Jedi for his own philosophy of the "living force" and eventually discovered this power in death, he taught this to Yoda, who then taught Obi wan. Anakin required no training in this regard, because he was the champion of the force, created by the force itself. It was his birthright to return to the force in this manner regardless of training. As he was the balance within the force, both light and dark - I see no reason why he could not represent Vader or Anakin as a spirit. His ability of a force ghost is beyond titles such as Jedi or Sith - he was the force personified and was a balance of light and dark. ...... Awesome. He definitely should be a force ghost. Ok... But at the end of ROTJ, he is all sparkly glowy and standing with Old Ben and Yoda. He is blue, and if my action figure collection has anything to say about it, the bad guys are red and the good guys are blue. Who knows how it goes - those were just my thoughts. Personally - I wouldn't like a Vader force ghost, as to me it goes against the whole overall story arch of his character - his redemption from the darkside. I think a Vader force ghost would undermine that very powerful story line of his character. They are interesting. I always saw Star Wars overall as the downfall and redemption of Anakin. Meaning that anything after ROTJ is useless, from a Skywalker point of view. Perhaps even from a fan point of view. As an example am going to use the Lion King here - The way I see it we have the PT where Simba is a cub and leaves the pride after his father's death. We then have the OT where he grows and becomes a strong hero/Lion and returns to thje pridelands to defeat Scar. To me the ST is very much like cheesy spin-offs like Lion King 2 etc. - they did the same thing with Aladdin in "Return of Jafar" etc. Those sequels to the classic Disney stories give the fans more stories but really do nothing for the original stories at all - just cheap knock-offs of a classic. That is how I feel about the ST.
Old Star Wars (before 2008) = the dead stay dead unless they're good guys then they get to be ghosts. New Star Wars (after 2008) = no one stays dead except OT characters. And Maul has to come back somehow because reasons. The only possible way I can see him continuing an arc is if they do indeed proceed with an Obi Wan movie. Yes Maul's arc comes to an end in Rebels, but the end of the Obi wan movie could skirt around the events of Rebels and end his arc there too, based on Obi Wan's version of the proceeding events as opposed to Ezra or Maul's. I think that could be done well. But my issue is that Obi Wan did nothing note worthy on Tatooine in exile. If he were running some missions like Ezra and Kanan, maaaaybee? We don't know what he did. I know he couldn't have done anything too crazy to risk the attention of the Empire - but perhaps some issues with Tuskens or Jabba or something. If we don't know what he was doing other than watching Luke, perhaps there are some interesting stories to be told. Personally I wish they never re-introduced Maul into the movies. If you are a movie goer - he died in TPM. If you are a fan following TCW and Rebles - then you know. Bringing him back into Solo was just a confusing move for the sake of playing some "fan service" to get some excited reaction in Solo - bad move really. Personally I would like his story built up in the continuation of TCW from when we last saw him at Sidious' mercy. How he is used to destroy the Nightsisters etc. That is a great story that needs to be addressed in the coming TCW series. Outside of TCW and Rebels being canon, It actually reinforces the idea that Maul lived to casual movie goers, who are "too old" for cartoons. I'm knocking on close to 40 - grew up with the OT, loved them! I enjoyed the PT (despite their faults). I also fell in love with TCW and Rebels - I enjoy Maul's story, that he lived beyond TPM, but like I say there are fans that enjoy just the movies - they don't read comics, books or watch cartoons. To those fans bringing back Maul its just confusion. My point is - if they are to re-introduce Maul back into the movies, then they need to do something with him. Without seeing TCW or Rebels, it is clear that Maul survived, he has found robotic legs and is now the head of a major crime syndicate - tells you all you need to know, without all the specific details. But what are they going to do with him now? For those movie only fans, they now know he is alive. Yes his story concludes in Rebels, but just seeing him in Solo, may not prompt those movie only fans to watch them. They now need to do something with his character arc in the movies - including his death in my opinion. Otherwise what was the point of him appearing in Solo? Know what I mean? I’d be willing to bet there’s going to be a TV show about Mail and his crime syndicate, and maybe Han and Chewie are helping or something. The guys at Rebel Force Radio bring it up sometimes and it actually seems like a good idea. I agree something needs to be done, maybe a Maul standalone, but we both know that Maul was introduced to give Solo 2 somewhere to go, especially with not knowing what happened to Qi'ra. At this point perhaps a Qi'ra stand alone movie? Wouldn't surprise me (another female lead). But unlike Rey, she seems like an interesting character that they could really do something and go somewhere with. it could flesh out more of Maul's story and why Jabba becomes the kingpin of the Underworld by ROTJ. Of course it could also hold cameos for Han and Chewie going forward too and better explain the change in Han's Character from what we saw in Solo compared to how he is introduced in ANH - just a thought. I would think that Qi'ra dies, that changes Han. But Jabba is the boss in PM already. Rey had potential, but she wasn't fleshed out and had no background story, that is why she fails. I think they set it up for Solo 2, and not a Qi'ra movie. Very true about a Solo 2 set up rather than a Qi'ra movie, but considering how Solo essentially "flopped" I doubt a sequel is afoot. It could be an opportunity to take it in a different idea than originaly intended, hence a Qi'ra movie. It would certainly limit most fan expectation while providing a fresh story with a new yet already established character - could be interesting. Not sure Jabba was the "Boss" in TPM, I mean at that point it was established that Tatooine was controlled by the Hutts, but Jabba wasn't the only Hutt on Tatooine. Gardulla is seen at the podrace as well (also mentioned as one of Anakin & Shmi's previous owners). Gardulla was described as an equal rival to Jabba and Jango eliminated that by feeding Gardulla to her "pet" Kraydragon (in the game Bounty Hunter) which apparently later spat her out - which is why Gardulla makes a presence in the Hutt council in TCW. TCW also notes that Maul takes over not only crime syndicates such as Black Sun, but the Hutt Cartel as well. This would include Jabba's operation on Tatooine. In Solo, Becket alludes that Jabba is rising into power on Tatooine (perhaps broken free of Maul's hold) and building up his criminal empire and looking for talent - which is where Solo and Chewie head to at the end. This could make an interesting Mob War or Crime Syndicate movie to follow-on from Solo and further develop the character of Qi'ra, Jabba, Solo and of course Maul. I agree I think Qi'ra would die. It would also seem that Maul falls from grace too, as he is quite the hermit when we see him in Rebels - hardly a powerful crime lord at that point - yet we know by ROTJ that Jabba certainly prospered. Again, could be an interesting story to tell, whether its a Qi'ra movie, Solo 2, a Jabba movie, Boba Fett movie or whatever. But I think bringing Maul up at the end of Solo and doing nothing with that is a waste to say the least. In Episode 7, Kylo Ren could have actually been having a conversation with Darth Vader off screen. The Sith live on through their artifacts. Would be sweet to see Kylo Ren learning from Vader in Episode 9. Darth Vader comic #22 sets it up so Vader could return. not saying its right...just what the big D will do to run with it.... I mean if 9 closes out the skywalker thing you know...KNOW there is going to be some big revelation no one sees coming that people will love or hate....and that 1-8 was just a big lead up to the person who finally brings balance back to the force.... "for a few years or something"
Speaking of letting things die ... the Prophecy needs to die. It was a bad premise when written and continues to hold that distinction. I'll bet Sidious wrote the Prophecy. And he let the slip of paper "fall" out of his pocket in the temple library and let the jedi roll with it. So that's what he meant when he said "Everything is proceeding as I have foreseen." I thought it was Grievous' droid army that destroyed the Nightsisters. I assumed that Sidious used Maul to build a criminal empire and control the Hutts and other crime lords in the best interest of the Empire, which would explain his role in Solo. ETA: At some point between Solo and Rebels, he must have done something to fall out of Sidious' graces for a second time. Maybe he took another apprentice and became once again a rival, just like he tried to do with Ezra later. Or the Emperor simply decided that Maul was no longer of use to him. He fell out because he took Savage as an apprentice in the clone wars. 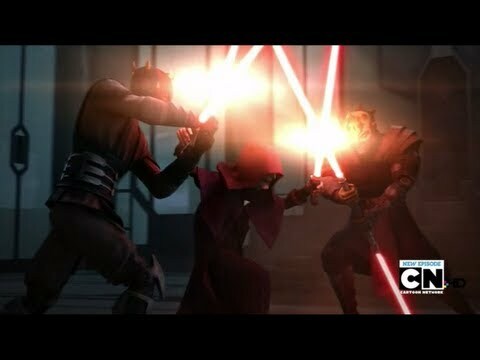 Cool 3 way saber fight between Sid, Maul and Sav. I believe Sidious allowed Maul to escape - and Maul unwittingly lead the Separatists to Mother Talzin and the remaining Nightsister clan - where Motehr Talzin is killed and removed from the chess board as a threat to Sidious' rule/plan.